Place 2-3 tbsps. oil in a large saute pan on high heat. Once the pan is smoking, add the mushrooms cut side down. Do not touch. Cook until golden brown (2-3 minutes) and turn over. Season salt/pepper and cook another minute or two. Remove from the pan and set aside. Place the leftover EVOO left into the pan and once hot, add the asparagus pieces. Season with salt/pepper. Saute 1-2 minutes or until slightly cooked through. Remove from the pan and set aside. To serve, put the Arugula onto a platter. 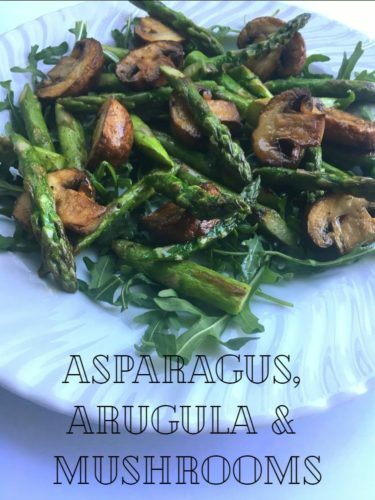 Place the mushrooms and asparagus all over the arugula. Dress with lemon juice and some fresh cracked pepper if you wish. Enjoy!